All orders placed Monday-Thursday before 2 PM (EST) will begin processing and ship within 72 hours*, pending availability and credit card authorization. Orders placed on Friday, Saturday or Sunday will begin processing, but may not ship until the following business day. Invalid shipping address will require verification from buyer and could delay the processing time. Once a shipment has been placed, please allow up to 3-4 business days for delivery of merchandise, unless chosen expedited shipping. BarefootCampusOutfitter.com will contact you with a follow-up email if, for some reason, the merchandise you have selected is currently out of stock or if additional identification is needed for credit authorization. BarefootCampusOutfitter.com uses USPS and UPS for delivery. It is the customers responsibiltiy to provide a deliverable address for the chosen shipping method. During checkout, you will have the option of choosing an expedited form of shipping quoted from original USPS and UPS shipping rates. *DELIVERY TIMES are dependent on Shipping method chosen. If you decide to refuse any shipments from BarefootCampusOutfitter.com, you are responsible for both the original shipping cost incurred and the cost of returning the package to us. This amount will be subtracted from your merchandise refund. 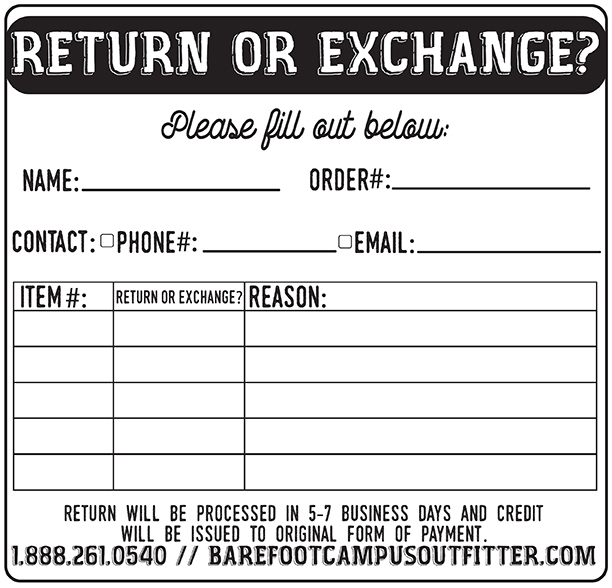 BarefootCampusOutfitter.com reserves the right to refuse a refund or exchange if merchandise received is not in its original condition or outside the 30 day return period. 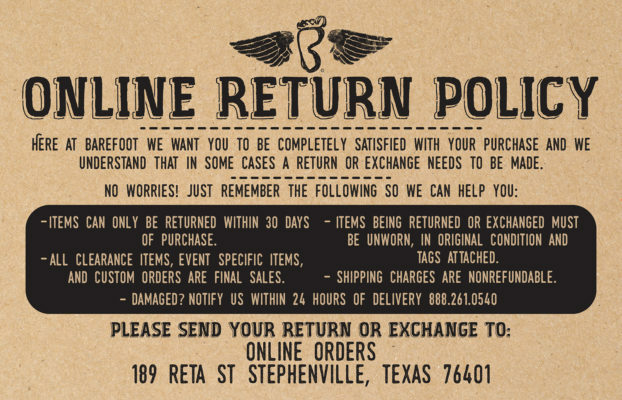 Ship your return or exchange through an insured trackable carrier, as BarefootCampusOutfitter.com cannot be responsible for lost or damaged packages. Items shipped within Texas, Florida, South Carolina, and Iowa will be charged sales tax.